“Free” is a fantasy when it comes to self publishing. With the Indie Revolution in full swing, there seems to be quite a bit of chatter in social media about what it should cost to self publish. If you were to believe some of the loudest voices, you might think if you pay anything to publish you are foolish. Fortunately there are other voices entering the discussion that point out there are costs associated with publishing a good book no matter what method you choose. Formatting an e-book can be free, but publishing requires an investment. PBS watches the self-publishing space and reports on it in the Media Watch section of their website. 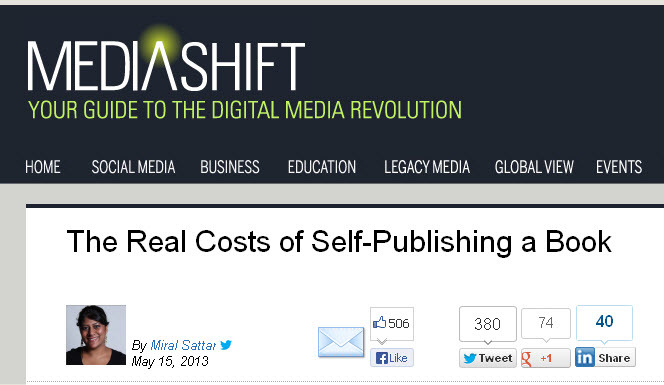 Recently one of the columns was written by Miral Sattar with the title: The Real Costs of Self Publishing. In this informative article, Miral, who is the CEO of Bibliocrunch, lays out some key areas every author should consider when publishing a book. More importantly, she suggests a range of costs someone might pay for those services. Here are some of the things to think about and the range of investment you might need to make based on a 70,000 word manuscript. To read the complete article, click here. Formatting for print and and digital conversion: If you’re looking to hire an expert, you can find someone to do the print-on-demand conversions for as little as $150 or as much as $2,500 to convert from Word or InDesign. Getting an ISBN: An ISBN (International Standard Book Number) is recommended if you’re doing a print book or want it placed in a library. Distribution: Lots of options here. If you do the work yourself, it is usually free. If you hire someone, they will usually take a percentage of sales. That is not necessarily a bad thing, because you have to evaluate how much your time is worth. You can do this yourself by following the instructions to get your books distributed into the various retailers. However, if you use a third-party they do take a percentage of each book sold. Marketing & PR: This is probably the toughest part after you’ve written the book. If you have the time, you can do a lot of the marketing yourself. Also, good book publicists can get you radio spots and press pickups for anywhere from $1,000 to $5,000 per month. What do you think of Miral’s assessment? Use the comment section to let me know if you agree and if there is anything she missed. You’ve got it right on the cost part! This process is not free (if you want to do it right and have something at the end of the day you’re proud of) no matter what people claim. Thanks for validating my comments. It is frustrating when people suggest you can do everything on your own for free. The reality is you need professional help to publish a good book. According to my research you’re right on target! My suggestion for the average person who feels that they can write a book is to take a writing course first, and learn how to write. You have to learn not to fall in love with your own words, and be willing to edit, edit, edit. I took a course from Long Ridge Writer’s Group and it was priceless. My mentor got me off to the best start that I could possibly have. Just because we all feel that we have a book inside of us, doesn’t mean that we have the skills to put it onto paper. If beginning writers (myself included) don’t want to put the time into a thorough course, they’ll need to pay accordingly to have someone else correct their punctuation, grammar, usage, etc.